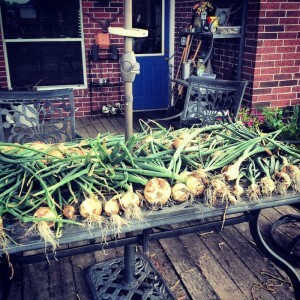 Well, May was a busy month around here harvesting things that have been in the ground for several months. This is the great payoff for all the hard work in the cold days of December and January. In the past I never had much success with onions. I would put them in the ground and leave them alone and they would wither and die before they ever became anything bigger than a pencil eraser. I thought I was no good at growing onions. I thought maybe our soil wasn’t good enough or our climate just wasn’t right for them. 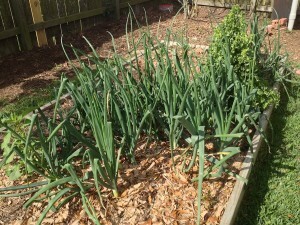 But after taking the Fort Bend County Master Gardening Program, I learned to grow onions among many other things, successfully. 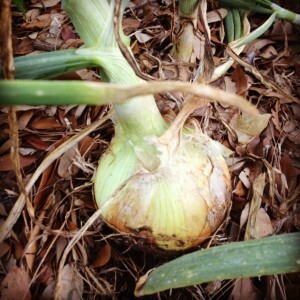 We planted 70 10/15 Onions on December 5th, 2012 in about 50 square feet of space. Three weeks later I began the process of fertilizing these beautiful pearls in my yard. 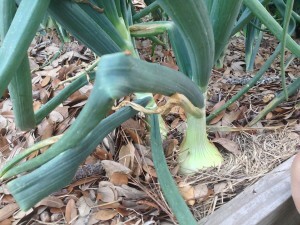 I learned that onions are very big Nitrogen feeders and what they want is FOOD in the form of Ammonium Sulphate. Ammonium Sulphate is all Nitrogen (21-0-0). I would go out there every three weeks on the dot, even if it was cold, even if it was sprinkling with rain, and give those onions their Teaspoon of Nitrogen each. 70 onions got 1 teaspoon of Nitrogen every three weeks! Now that’s someone that wants to have some success with her onions! We harvested over 25 pounds of onions. 25 pounds! I, along with my family, were so excited! 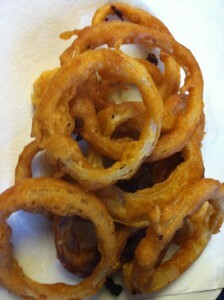 Of course, we made onion rings right away. But what are you going to do with 25 pounds of onions, you might ask? There’s only so many onion rings you can eat! Well, you dry them out before you store them. If you do this, they will store for many months in a closet, under the bed in boxes or in your pantry. First you must pull all of the onions out of your garden of course. I’ve heard that a lot of people pull them up and leave them in the dirt to dry out. But we have two dogs who would most likely think they were fetching balls, so we didn’t choose this option. What we did do though is to lay them out in a single layer on our outdoor table. You need to let them dry in the sun for at least a couple of days. We then moved them to the garage to dry out further, away from the direct sun. It’s important that the onions be laid out in single layers so that they won’t begin to mildew. When the green stalks have dried completely and the outside of the onion has developed a papery skin, they are safe to store. We found several Coke boxes that cases of Coke come in, and laid them in single layers in the boxes and stored them in a cool, dark pantry. I’ve heard that some people put them in boxes and place them under their beds. The most important thing is that they be stored where it is dark, cool and dry. We are so excited about our onions! Do any of you have some tips on how to grow onions? I would love to hear your tips or suggestions on growing onions. Or, if you have any questions about growing onions, feel free to ask away in the comments section! You are currently reading Onion Harvest at Michelle Conaway.